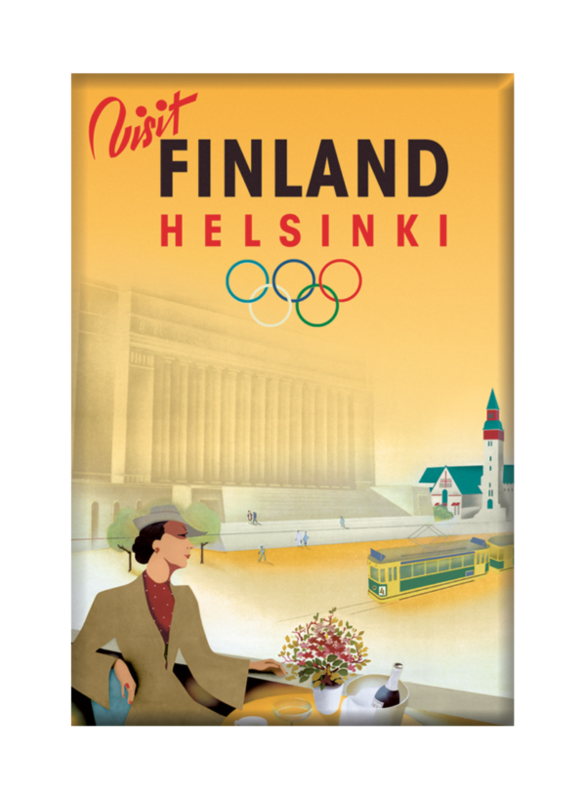 Our laminated poster magnets can cope with heavy duty usage and a never-ending desire for Finland. This poster was created for the Olympic games that were supposed to be held in 1940 (due to the war the games were postponed until 1952). Jorma Suhonen is one of Finland’s greatest poster masters and a legend in the Finnish advertising industry. He was one of the men behind the influential ad agency SEK. This poster also triggered the whole Come to Finland book project. When author Magnus Londen saw the poster many years ago in an antiquarian book shop window in Helsinki he was spellbound. The stylish lady, the glamourous life, the champagne! The poster had everything Helsinki should have! Soon the Come to Finland poster hunters were digging deep into dusty archives and the rest is history. That particular poster is also the only original print of the Champagne Lady that the poster hunters have located during their long search – and nowadays it’s of course a part of our collection.